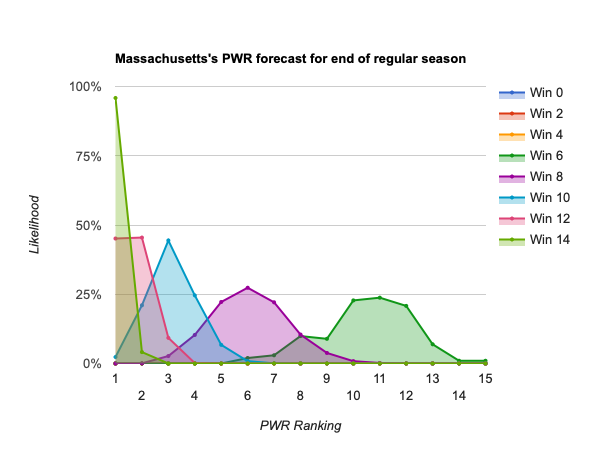 After the holiday break is generally considered a good time to start paying attention to the PairWise Ranking (PWR). Remember that PWR is a ranking whose calculation mimics the NCAA’s tournament selection process, so the final PWR ranking perfectly predicts the teams that will be selected for the NCAA tournament. The 2014 article, When to start looking at PWR (revisited), examines how today’s PWR is reasonably predictive of the final PWR. The table on the PWR By Wins page shows you how many wins each team needs to likely finish at each PWR ranking. So, for example, if Mass. wins half its remaining scheduled games (7 of the 14), it will probably end the regular season in the 10-12 range, and thus likely to make the tournament. If you want more detail on a specific team, you can click a team name to see the probability curves of how likely that team is to end the regular season with each PWR ranking with a given number of wins in its remaining scheduled games. That helps you see, for example, that though Mass. has a decent change of finishing anywhere from #3 to #9 with 8 more wins, #5-#7 are much more likely. This entry was posted in Uncategorized on January 17, 2019 by jim.